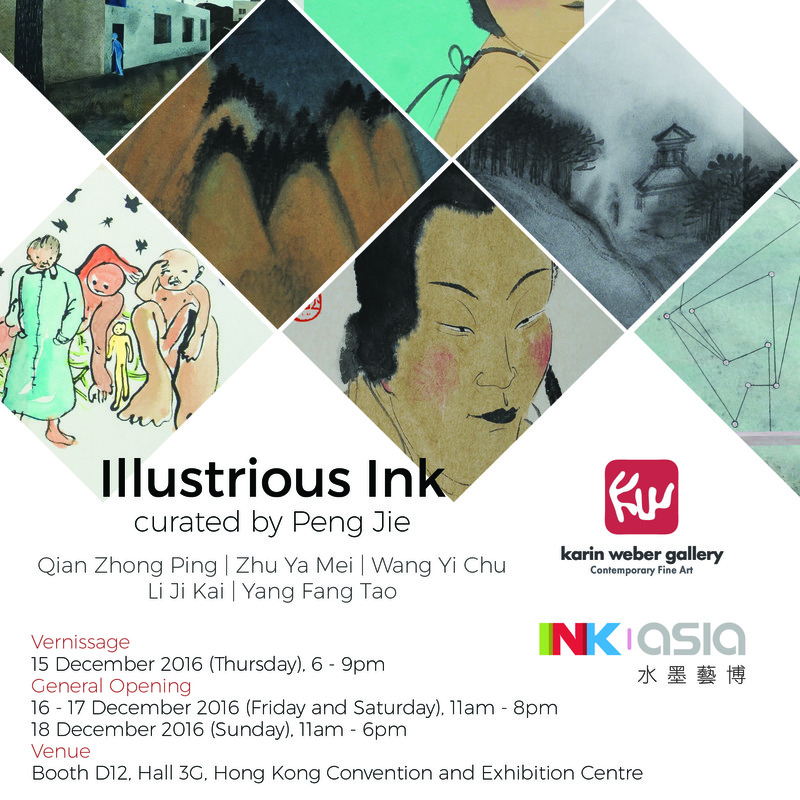 Karin Weber Gallery and curator Peng Jie present an exquisitely curated exhibition, ‘Illustrious Ink’, for Ink Asia 2016. The exhibition showcases fine ink works by five Mainland Chinese artists: Qian Zhong Ping, Zhu Ya Mei, Wang Yi Chu, Li Ji Kai and Yang Fang Tao. The featured artists’ styles are distinctive yet subtly interconnected. The female artists Zhu Ya Mei and Wang Yi Chu both come from families with a strong artistic tradition. Zhu’s landscape transcends the mundane with its calmness and naturalness. Wang sees in her dots and lines rhythms that are connected to demarcate an innovative space. Transformed and perfected among the depicted landscapes, both artists reenact their distinctive realms. Qian Zhong Ping’s ink and colour works deserve deliberation. The everyday use of colours and distinctly simplistic composition of figures highlight a sense of internal tension. The works are consummated with humour, the robust figures are allegorical and imbued with the nuanced character of the literati. Li Ji Kai’s fan paintings are as untrammeled as Rabelais’ Gargantua and Pantagruel, the myriad figures indulge in rhapsodic delights. Strange are the figures and estranged are they from each other, much like the lonesome stars that shine upon them in a cold wintry night. This crisp sense of chilling detachment resonates in Yang Fang Tao’s works. Maze-like paths under heaven freeze into a frame for the viewer to engage in a process of retrospection. Aptly named ‘Illustrious Ink’, the exhibitions brings together the illustrious realms of the artists’ mindscapes that are connected and constructed by ink. It will host 50 leading galleries and institutions from China, Hong Kong, Taiwan and other countries. Special exhibitions on particular themes, “Taiwan Pavilion” and “Modern Chinese Calligraphy”, along with “Ink Plus” which features works by Hong Kong artists, will together showcase ink artworks by renowned and emerging artists from Hong Kong, Taiwan and China, covering different media including painting, calligraphy, photography, video and installation. Meanwhile, the Ink Society, Hong Kong will present an academic programme comprising a series of lectures, “Dialogues on Ink”. The five pillars of INK ASIA 2016 are modernity, abstraction transformation, emerging, salon and co-curation. “Modernity” focuses on the development of ink art in the 20th century; “abstraction” recognises artists who create their own visual language; “emerging” promotes new concepts by galleries and their new artists; “salon” examines the effect that new media is having on the genre in the 21st century; and “co-curation” unites different participants in the art industry with dynamic programmes promoting ink art.